We have some new merch and we are excited to share these with you! 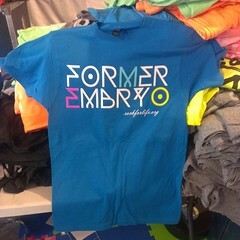 We redesigned “former embryo” and put it on a black and turquoise crew neck. Available for only $17 plus S&H. 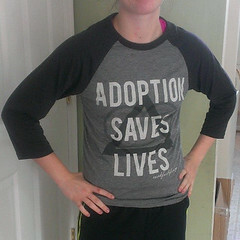 We put the “Adoption Saves Lives” artwork on a grey baseball style shirt with tri-black sleeves. Very cool! Available for only $25 plus S&H. We also tried the “I AM PRO-LIFE” design on a black crew neck sweater. Available for only $35 plus S&H. And finally, we redesigned the “I AM PRO-LIFE” slogan and put it on a grey heathered crew neck sweater ($35), a white crew neck shirt ($17) and a white crop top ($20). What would of happened to Steve Jobs if he were conceived today? As most of you know by now Steve Jobs, the co-founder, CEO and chairman of Apple, Inc. passed away yesterday from pancreatic cancer. Our condolences to the family of Steve Jobs for their loss. We are praying for you during this difficult time. Did you know Steve Jobs was adopted? He was born in San Francisco, adopted by an Armenian family. His biological father is a Syrian Muslim and his mother is an American of German ancestry. Both parents were attending college at the time of his conception. His biological mother’s father didn’t approve of her marrying a Syrian so they placed Steve in an adoptive home. The story is fascinating! Since Steve Jobs was born before the U.S. Supreme Court decisions Roe v Wade and Doe v Bolton (which opened the floodgates of abortion on demand) adoption was a prefered choice over abortion, and much more acceptable and available (abortions were illegal) then today. What if Steve Jobs was conceived today? Since his parents weren’t married and both attending college there is a much higher chance he would have been aborted. Could his mother of withstood the pressure from her friends, her classmates and her family members to abort? Would she of withstood the pressure of a Planned Parenthood abortion salesperson telling her pregnancy is just a blob of tissue & abortion is harmless? Many college mothers these days choose abortion over life for their child. The abortion rate for college aged mothers is astronomical. I would easily bet my iPhone4 that if Steve Jobs would have been conceived today he most likely would have been aborted. Of course I am, as well as most individuals are thankful that Steve Jobs was conceived before Roe v Wade. Many are thankful not only that he is alive but for his story, his adoption, his success story, his inventions and all the Apple products he made. Adoption is powerful! Without the willingness of his mother to place her son in an adoptive home AND for Steve’s adoptive parents to take him as one of their own who knows how the world would be today. Would we have Apple, Inc.? What would we do without our Macbooks, iPhones, iPads, iTunes, etc., etc.? For more information on adoption and adoption services check out Bethany Christian Services. At First Love Festival we had an opportunity to meet Nate Sara, the bassist for an awesome band called Compelled. Nate is a great guy who really has a heart for people, including the preborn and those affected by abortion and really loves the ministry of Rock For Life. Here is Nate sporting one of our “Adoption Saves Lives” shirts. Compelled is a great band and you should check out there website and listen to their music, “like” them on facebook and follow them on twitter. TOMORROW: National Pro-Life Chalk Day! Tomorrow we, Rock for Life alongside Students for Life are co-sponsoring National Pro-Life Chalk Day! On February 3rd we held the first ever national event and it was a huge success! I personally chalked at the University of Mary Washington and oh boy did I cause quit the controversy! The more we talk about abortion and what the act does to a baby and his / her mother the more hearts and minds are changed to the pro-life position and the more babies lives that are spared. One way to get people talking is to sidewalk chalk pro-life messages. So tomorrow, grab some sidewalk chalk, grab some friends and start chalking public sidewalks. It’s fun and a little rebellious! 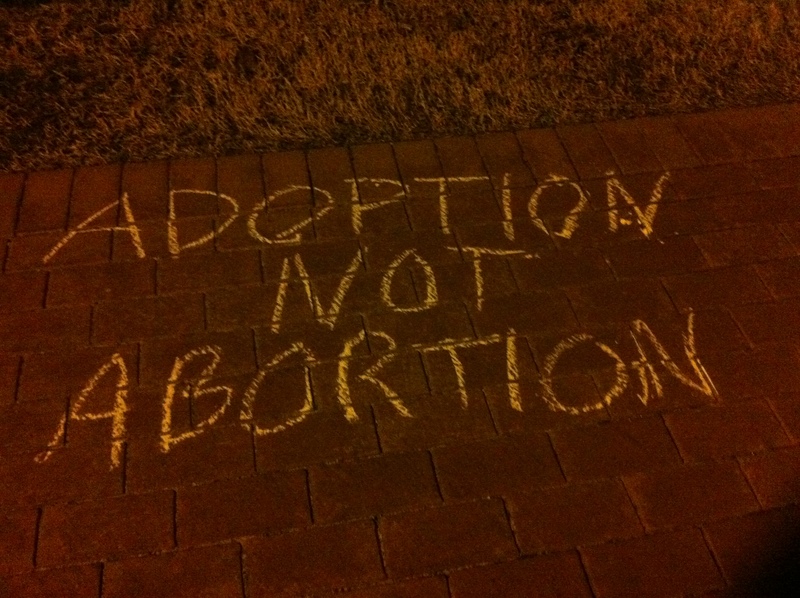 Sidewalk chalking is inexpensive, fun and another creative way to get the pro-life message out. So, whatever it is you are doing tomorrow take some time to join thousand of pro-lifers nationwide who will be participating in National Pro-Life Chalk Day. Visit the website at www.NationalProLifeChalkDay.com for messaging ideas and tips, tell all your friends by forwarding this email and posting the website on your facebook and twitter. Then take pictures and post them on your Facebook and Twitter as well and let us know how it goes! Thanks to photographer Chelsea St.Pierre and models Kelley Rocca, Christina Clifton, Tim Cackett & Kevin Feliciano! This weekend we want to extend an amazing offer to help you fulfill all of your Christmas shopping needs. This weekend, starting this Friday (12am, Nov. 26th) through Sunday evening (11:59pm, Nov. 28th) everything on our store will be 25% off! 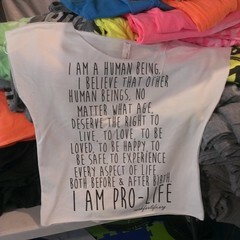 That’s right, 25% off of pro-life t-shirts, hooded sweatshirts, zip-up hoodies, military caps, bumperstickers, buttons, etc., etc. You will need the special coupon code “blackfriday” at checkout for the discount. This Friday morning, instead of waking up at some insane hour, freezing in long lines outside, getting trampled on while scrambling for coveted items you can wake up at your leisure, log onto the Rock For Life webstore, order everything you need for your loved ones, get a nice discount while supporting the pro-life cause. How cool is that?!!? I am an outcome. I am a very possible possibility. I am a life that was not only saved but made better by adoption. My story is the result of two loving decisions. One decision was made by a couple who chose to love and raise a child that was not their own. The other decision belonged to a mother in a difficult situation. This mother placed me in the arms of another family not because she didn’t love me but because she loved me so much. Both decisions were difficult. But they are both decisions I am eternally grateful for. 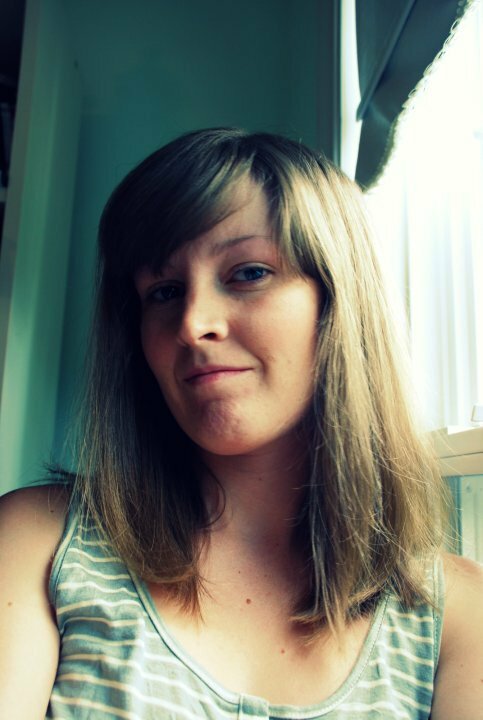 Lisa’s testimony has been posted on Students for Life’s facebook fan page. Go check it out and share it with all your friends. As part of National Adoption Awareness Month I wanted to share with you this video. It is an older video as part of our “My Pro-Life Story” playlist on our YouTube Channel. This young man was adopted and later found out that his biological parents where drug addicts and extremely close to aborting him. Adoption Saves Lives and this selfless gift by all involved saved his! Don’t forget, as part of National Adoption Awareness Month the proceeds from our Adoption Saves Lives line of merchandise sales in the month of November will be used to promote adoption awareness and raise funds. Make sure to check it out, pick something up, spread awareness and help us out by telling all your friends. Thanks! November is National Adoption Awareness Month and we want to participate by highlighting our “Adoption Saves Lives” merchandise. By purchasing and wearing a shirt, bumpersticker or button you are not only helping to raise awareness about adoption but you are also helping to raise funds for adoptions and adoption awareness. A portion of all proceeds of the sales of these items starting today through the end of November will go to adoption and adoption awareness. 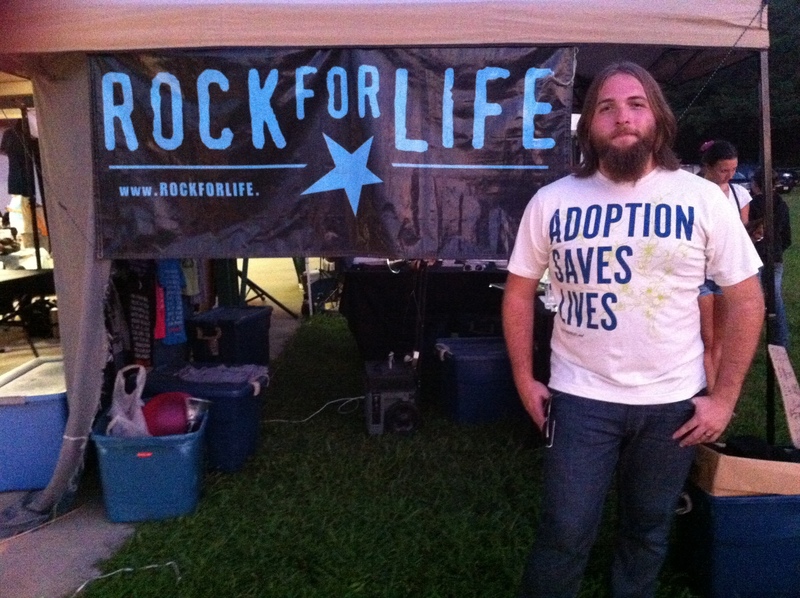 So join Rock For Life in spreading awareness and raising funds about adoption this month! To make a purchase go to www.RockForLifeStore.com. You can also make the purchase from our Facebook page by going to www.Facebook.com/rockforlife and clicking on the “store” tab. Please share this effort by forwarding this email to all your friends, posting this on facebook, twitter, myspace, etc., etc. And make sure to check out our blog where we will be blogging often in November about Adoption, adoption testimonies, etc., etc. This summer we launched the “Adoption Saves Lives” line and it was widely successful. Why is that? Pro-Life people believe in adoption. Adoption is a loving, caring and compassionate choice for mothers who are facing a difficult pregnancy situation. Major props to moms who place their babies into a family whose members are eager to care and love on that child. What a great sacrifice. Thank you! Let’s share our love and support for these moms by spreading awareness and raising funds for adoption this month!